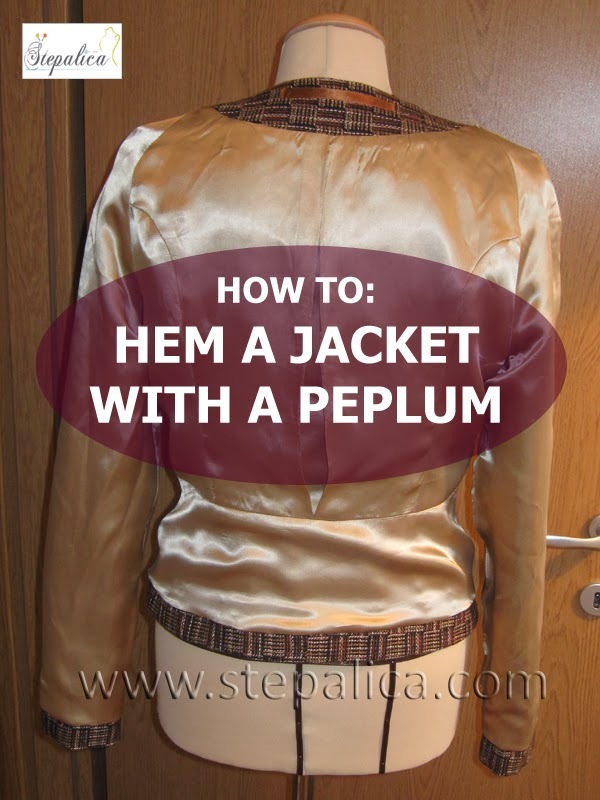 A jacket with a peplum can cause some issues when hemming if a pattern isn't properly prepared for this operation. The hemline on this type of jacket is curved due to the peplum's shape - the more voluminous the peplum is, the more curved hemline is. When working on a jacket with a straight hemline, the process usually assumes adding some length to it for hemming. However, applying the same technique on a jacket with a peplum might cause some problems. The picture below displayes pattern pieces of the peplum of my A. McQueen jacket - the back peplum piece is on the left and front side peplum on the right. Note how the side seams are angled, thus making the pattern flare towards the hemline. If we try do add some extra centimeters to these panels, the bottom line of the added length will be wider than the actual hemline. The picture bellow demonstrates my point. If we try to fold up the seam allowance, we'll see there's some extra width included with it. Imagine the amount of the extra width you'd get if you applied the same principle to the front side peplum; then multiply it by two for the left and right side of the jacket, and you'll have a lot of fabric to deal with. 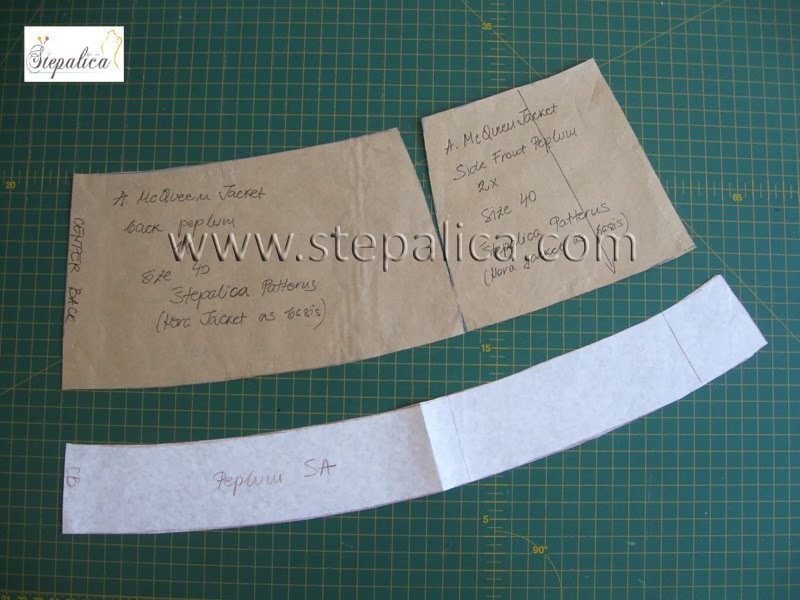 Therefore, the curved hemline affects the way we hem the jacket, as it calls for an extra pattern piece that I'll refer to as a hem seam allowance - HSA. 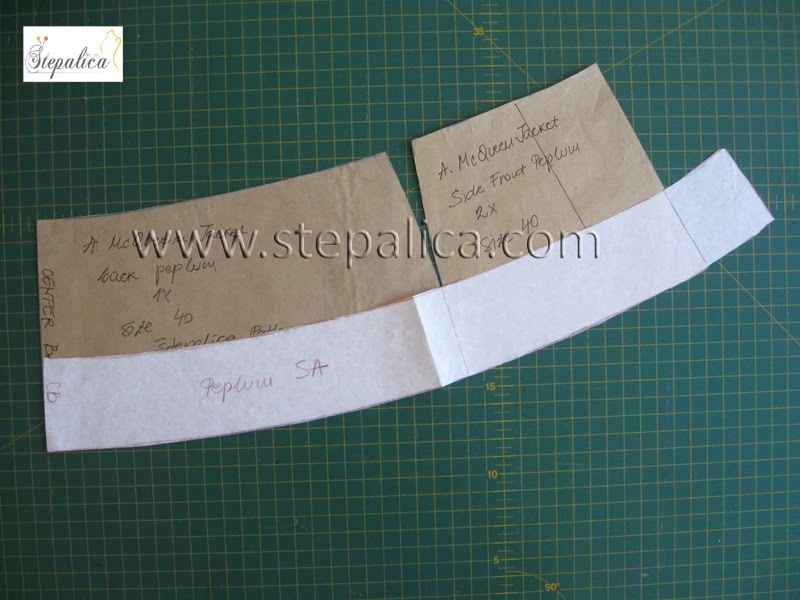 So, if you're making a jacket with a peplum, examine your pattern and determine whether it includes a HSA pattern piece. If not, I recommend making one, since the process is rather simple and straight forward. 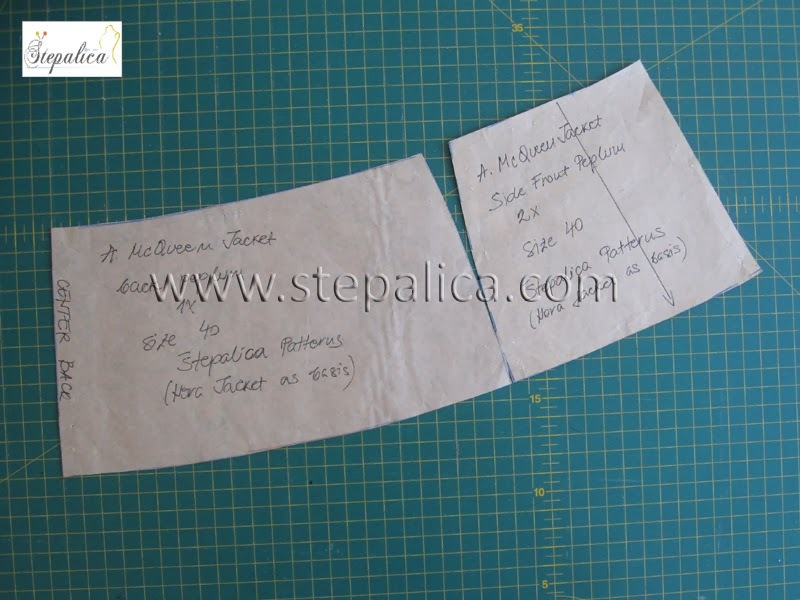 The HSA pattern can be made as a single piece for both back and front peplum; join the peplum pattern pieces along their mutual seam line, as shown on the picture. Copy the shape to a new piece of paper. 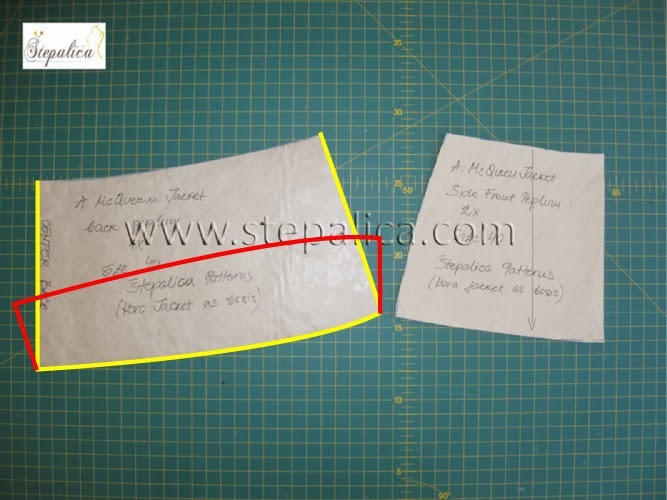 On the copied panel, draw a curve parallel to the hemline, distaned 4 cm from it. Cut the shape and you've got the HSA! Note: the front facing of the jacket is a bit narrower than the shell panel, so I lengthened the HSA a bit so that it meets the facing panel. When cutting the fabric, you can cut the HSA as a single piece, or as two separate pieces that you sew together along the CB seam. Fuse an interfacing to the wrong side of the HSA. Sew the HSA panel to the jacket, press the seams well and attach the lining following your usual method.